Calle Mercaderes, pedestrianized with the support of EMBARQ Andino in 2008. Photo by Gwen Kash. Welcome to Arequipa, the famous “White City” of Peru. 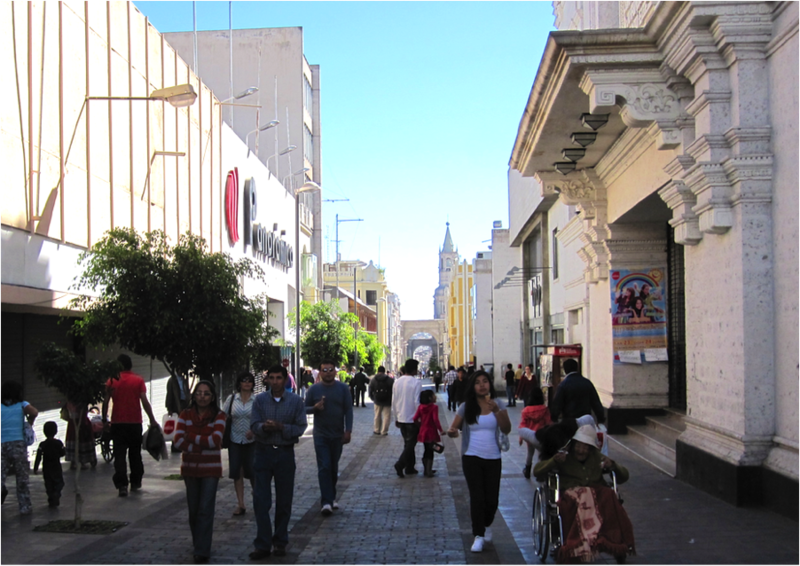 EMBARQ Andino has been working with the municipality here to improve transportation for all arequipeños, starting with the highly successful pedestrianization of Mercaderes Street. Now, the city is taking on a much bigger challenge: integrating the entire public transit system. The new Integrated Transport System (SIT-ArequipaBus) is designed to mitigate Arequipa’s troubles of congestion, air pollution and traffic safety. SIT-ArequipaBus will include an upgrade for the current bus fleet, reorganization of routes throughout the city, and a new bus rapid transit system. 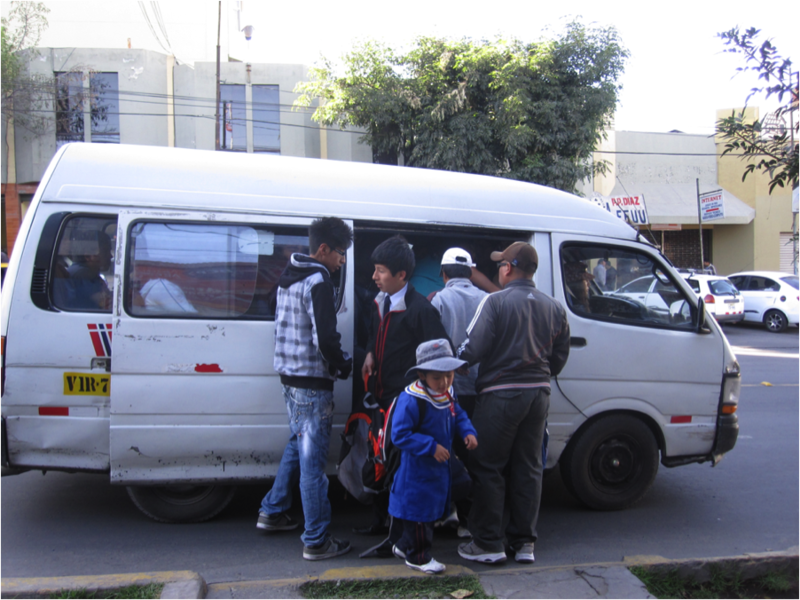 How aware are Arequipa’s public transport users of the problems SIT-ArequipaBus is designed to solve? What are their concerns? To find out, we talked with more than 200 transit riders in June and July. 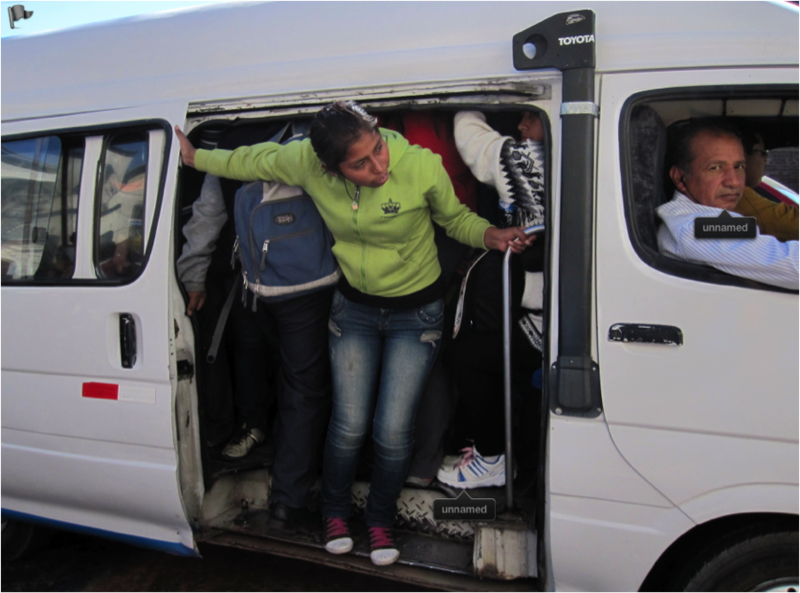 A combi drops off passengers in Yanahuara. Combis are not legally allowed to carry standing passengers, but this regulation is not enforced. Photo by Gwen Kash. Transit riders’ most common complaint about the current transit system was the condition of the vehicles used for public transit. This issue was mentioned by 39 percent of those surveyed. The market is dominated by minivans (locally known as combis) and minibuses (called coasters.) Many of these vehicles, which were already used when they were imported, are now more than 20 years old. Old vehicles are notoriously bad for air quality, but passengers were also very concerned about the comfort of the small, poorly maintained, and ubiquitous combis. Said one, “The old combis shouldn’t be working anymore. They break down in the middle of the trip!” Taller passengers must stoop while standing, and the legroom in the bus seats makes flying coach seem like first class in comparison. The many passengers who expressed concern about the condition of the vehicles are likely to be pleased that SIT-ArequipaBus will remove the old combis from service and replace them with larger, cleaner, modern vehicles. Rush hour traffic on Ave. La Marina. This picture contains three public transit vehicles and at least 25 taxis. Photo by Gwen Kash. The second most common complaint was congestion, mentioned by 29 percent of respondents. One component of the congestion is the public transit fleet itself: a large number of small vehicles take up more space on the street than a smaller number of larger vehicles. However, an additional issue is the proliferation of taxis, both formal and informal. The ownership of private vehicles is also growing steadily, and some of these new auto owners earn extra income by converting their vehicle into a taxi. By some estimates, Arequipa has more taxis than New York City, despite having a population that is only one-tenth as large. 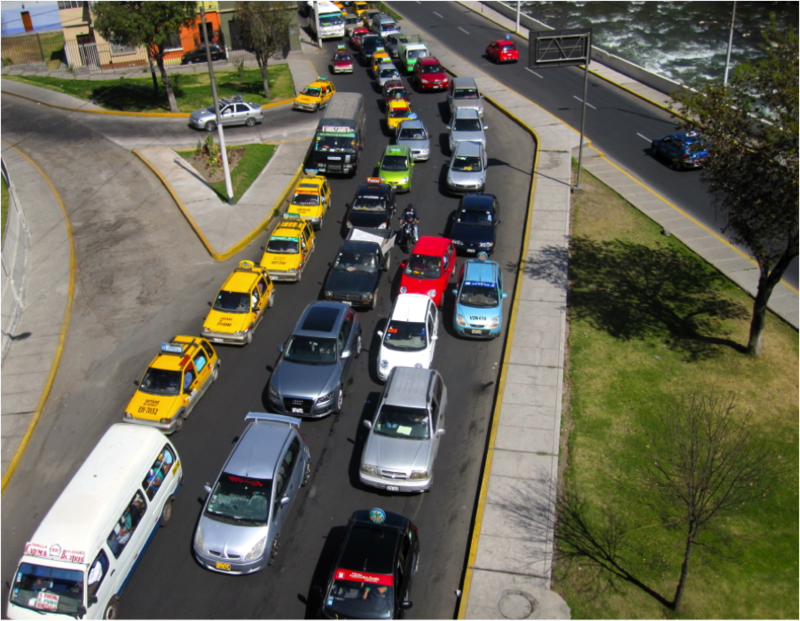 The new BRT system will give arequipeños a way to cut through the congestion. It will also return transit to the city’s colonial center, where extreme congestion often renders walking faster than taking a taxi. It is hoped that the higher level of service will attract some of Arequipa’s middle-class residents to take the bus instead of taxis or private cars. A fare collector keeps an eye out for potential passengers as her already-packed vehicle drives away from the bus stop. Photo by Gwen Kash. Because SIT-ArequipaBus will formalize the transit system, drivers will have greater training than they do now. Fare collectors will be replaced by smartcards. However, the transformation of the business structure will have equally profound effects on the treatment. Under the current system, fare collectors and drivers make their living from the fares collected. In order to make enough money to get by, it is important that they get as many passengers as possible and make as many runs as possible. This results in an economic incentive to fill the vehicle beyond capacity, rush passengers who are attempting to get off the bus, and drive unsafely. The new contract structure will eliminate this incentive. 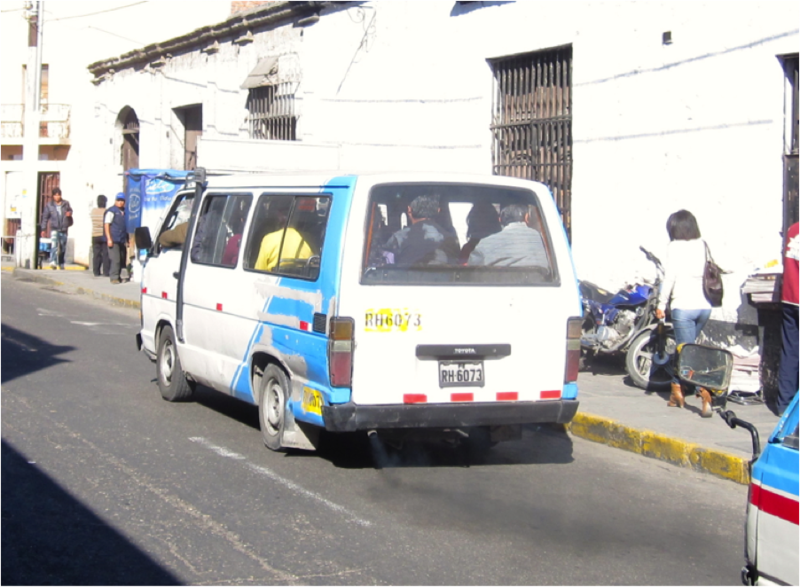 Many public transit vehicles in Arequipa emit visible smoke. Photo by Gwen Kash. While pollution may not be at the forefront of all transit users’ minds, it’s clear that they are aware of the issue’s importance. Some mentioned global warming, greenhouse gases, the ozone layer, or a general need to take care of coming generations. This study was funded by EMBARQ and the Carolina Transportation Program. With thanks to EMBARQ Andino and the survey team: José Llanos, John Zuñiga, Ricardo Arias, Raí Monrroy, Joaquín Malargao, and Ludwin Torres.